We bring you the chapter "Story of a Real Man" from the book by Sergey Smirnov "Stories about the unknown heroes", dedicated to a woman, Mary tankman Lagunova, which is one of the battles lost legs, but nevertheless continued service. At first this history, surprising as a legend, has brought to me the letter of the televiewer and the war veteran from far Ural small town. 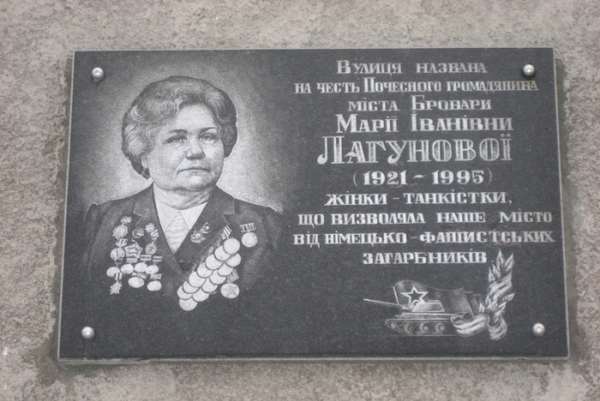 That was the story about girl-tankman Maruse Lagunovoj who has lost in battle both feet, but managed again to rise in a system of the Soviet Army, about the girl who on the fate was as though the sister of "the present person" Alexey Mareseva. Multimonthly searches through television while traces have not resulted at first in capital of Ural Mountains Sverdlovsk, and then to Ukraine, in a city Khmelnitskiy where there is now a live heroine of this history Maria Ivanovna Lagunova have then begun. And when in my arm certificates of friends and eyewitnesses and M.I.Lagunovoj's memoirs have collected also, was found out, how it quite often happens that byl there was even more unusual, than a legend which has originated from it. However, there are biographies which do not need comments, - they speak for themselves. Such is Maria Lagunovoj's biography. Life almost has managed at once coldly with the girl who was born in 1921 in far steppe village Okolnichkovo of the Kurgan region. To it was four years when mother has died and the stepmother has come to the big country family from 12 persons, malicious, as in national fairy tales, and especially taken a dislike to the younger stepdaughter - Marusju. Children, hardly becoming teenagers, parted from the dwelling, early began independent life. In 10 years Marusju, fortunately, took to itself elder sister working on the railway in Sverdlovsk. The girl went to school only five years. Then it was necessary to launch study and to go in the nurse, in the servant, - earnings of the sister did not suffice. Sixteen years Marusja has come on Sverdlovsk plant "Уралобувь". At first was chernorabochej, and in 1941 when war has begun, it already worked as the electrician of department on duty. The senior and favourite her brother Nikolay has left on front. In some days Marusja too was in a military commissariat and asked to send it to army. To it have answered that at plant people too are necessary. But it was persevering and has come in second, in the third time... Eventually voenkom has surrendered and has sent it to study in school of military tractor operators in the Chelyabinsk area. In the winter of 1942 it already served in a batallion of air field service on the Volkhov front, in several kilometres from forward positions. The service was heavy: at times she sat all day and night at tractor levers, clearing aerodrome of snow or forwarding to bombers fuel, ammunition. In a batallion there were also other girls-traktoristki, but Marusja Lagunova has proved to be the strong, hardy, and it had to carry out the most difficult and responsible tasks. The overloading and a constant sleep debt have affected on its health, and in the autumn of 1942 the strongest pneumonia has laid it on two months in hospital. Therefrom it has got to a spare regiment where it have made the projectionist, without paying attention to persevering requests to send on front. In February, 1943 to a regiment there has arrived the military representative from Ural Mountains - to select some honeycombs of persons on headings of tankmen - mechanics-motor-men, bashnerov, radio operators. When Marusja Lagunova has come to it, asking to take and it, voenpred only has grinned such naivety. - That you, the girl! - he has reproachfully told. - the tankman is purely man's trade. Women in tanks do not take, as well as on naval vessels. It the law. It has left depressed, but not conciliated with failure. And the next day mail has brought the letter from the sister with a heavy message: death of the brave brother Nikolay has perished in the war. To this grief Marusja reacted not only tears - it has sat down and has written the letter to Moscow to Michael Ivanovichu Kalininu. In some days voenpred has obtained the order to accept Maria Lagunovu in number of cadets. He needed to obey only. So among 700 men, the future tankmen who have arrived in March in the city of Nizhni Tagil, there was one girl. Command of an educational tank unit at first has accepted it as someone's inappropriate joke. But when it was found out that there is an order from Moscow, and the girl seriously wishes to become the mechanic-driver of the tank, commanders have decided to resort to arrangements. - Fathom, it not the maiden service, - convinced Lagunovu of a unit headquarters. - be engaged in better female business - go to work in a dining room or the clerk in a headquarters. Want, we will arrange you with the seamstress in an army workshop? Will live among girls. And after all here you one, it becomes difficult. But she still repeated that wants to be the tankman and to go on front, to take vengeance on the enemy for death of the favourite brother. Then to it have suggested to go to other city: there supposedly the volunteer tank case from uraltsev is now formed. marusja has fathomed that it is a dirty trick - it simply want to get off, and has refused flatly. She knew - behind it there is an order from Moscow and as commanders twist, they should carry out it. And has got out. Two days after Lagunovu were called by the commander of a batallion major Honin. - I with you, Marusja, will speak frankly, - he has told. - you at us first of a female, and we are simple in difficulty as to you to approach, - service difficult, demands to cadets big. Look, do not bring in study. And you will end headings, there it will be visible that with you to do. Meanwhile I allow you not to go to dresses. The girl even has reddened from disappointment. She has answered, as to dresses will go also all service to carry on a level with men. - I do not accept any exclusions, - she has resolutely declared. - and I will end headings - send on front, in back I will not remain. The small closet which to it have taken away in a unit arrangement became unique exclusion for it. In all the rest, it was the same cadet, as well as men, and sharp-sightedly watched, that to it did not do the slightest indulgences. 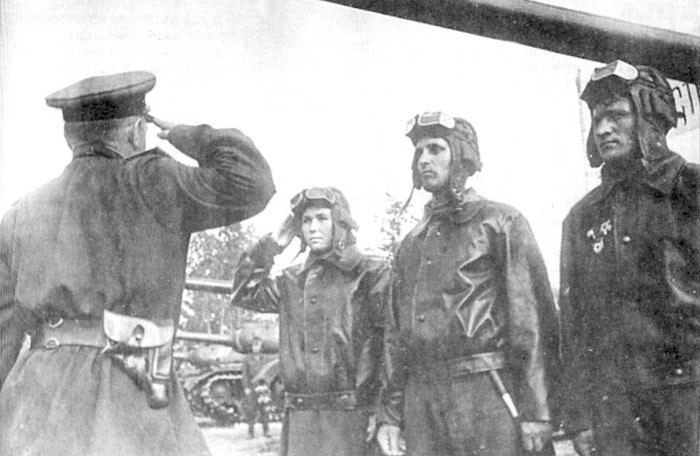 The program of headings has been counted for four months, but tankmen were demanded by front: events on the Kursk arch approached. In June to the best cadets have suggested to pass examinations ahead of schedule. Lagunova has insisted, that it have switched on in number of graduates. It has handed over technics on good", tank driving - on excellent". As persuaded her to remain in a shelf the instructor, it has disagreed. Tankmen have accepted on a factory of the car and have entrained them on platforms. Before sending on front in a factory yard joint meeting of workers and tankmen has taken place. And Marusja Lagunova, standing in crowd, continually reddened: from a tribune spoke about its persistence, persistence, a self-discipline and named it to the applause of collected pride of a regiment. But ahead still there were many tests. When tankmen have arrived on front and were a part of 56th Guards tank team, command, having learnt that on one of cars the mechanic-driver the girl, has referred to to it as to annoying absurd. However, the former brigade commander of guards well tells about it in the letter the colonel in resignation T.F.Malik living now in Kiev: "... There was a 1943. The team prepared for battles on the Kursk arch. For replenishment to us profit from Ural Mountains mid-flight companies. I, as kombrig, did review by the newcomer to crews of fighting vehicles. I approach to one of crews. Report: - the Tank commander lieutenant Chumakov, the mechanic-driver sergeant Lagunova. - Not Lagunova, and Lagunov. - A companion kombrig, is the girl, Lagunova Maria Ivanovna. - How the girl? The Mechanic-motor-man and the girl?! Before me there is on a rack "quietly" tankman of medium height, good bearing, with the serious strong-willed and suntanned person. I have been extremely surprised that the girl has appeared the mechanic-motor-man of a battle tank. I had to see at the front women who well coped with heavy front service of nurses, doctors, communication men, snipers, pilots and with other military trades. But the mechanic-driver, moreover glorified "tridtsatchetverki", never saw. The history yet did not know an instance that the girl conducted the tank in battle. In a first moment I have been strongly puzzled and did not know how to arrive with Lagunovoj. At that time I have been deeply convinced what to be the tankman - not female business. The Mechanic-driver should possess the big physical strength - after all to operate tank levers, the big muscular voltage is required. It is necessary to be able in any conditions and under any weather conditions on a flight and in battle to conduct the tank. In the summer in hot weather the temperature in the tank attains 40-50 grades, and in battle at intensive delivery of fire powder gases accumulate - all it complicates crew acts. Besides, tank crew, especially the mechanic-driver, tests the big mental voltage when the opponent conducts a gun-fire on the tank in battle. The iron will, self-control, composure Is required. - I have arrived on front not to sit out in back. It have supported crew and officers of subdivision ". As remembers M.I.Lagunova, for it lieutenant Chumakov, the commander of its car who an aftereffect was killed in action has risen mountain and has posthumously been awarded ranks of the Hero of Soviet Union. - Maria Lagunova the excellent mechanic, - has firmly declared it kombrigu. - I warrant that it will operate car in any conditions. Her have left alone, but for a short while. When tankmen of new replenishment began to distribute on batallions and companies, there was a same question - commanders could not substitute to themselves as it is the woman the tank will move in battle. Have again begun arrangements, offer to pass in a headquarters, far away from a first line. And again there was the good and courageous person who has gained the girl. It was the substituent of the commander of a batallion by a political unit captain Peter Mitjajkin. - Probably, it is difficult for overpersuading, - he has told to other commanders. - we will not insist, companions. We will do some fighting, sergeant Lagunova. Only, chur to be at war well! You I will watch in battle. She has learnt that zampolit always goes into battle on one of head cars and no miss of the tankman will be harboured from its sharp-sighted sight. But she has been assured of herself. At last the battle-order has come. Cars have got out on initial positions and stood disguised in shelters: nearby gears were already torn. Battle on the Kursk arch was in a heat. Before battle there was again captain Mitjajkin, has had a talk with tankmen and has reminded Maria Lagunovoj that will observe of it. And then cars have brought to a first line, ammunition preparation has rung out, on the tank reservation ten submachine gunners have jumped the person, and lieutenant Chumakov has given a command: "Forward!" It has remembered this first battle in all its smallest details. Through the vision slit she saw agreed orienting points and conducted the tank on them. To a limit stress hearing, it caught in shlemofone commands of lieutenant Chumakova. To hear something all it became more difficult: to a motor roar booming shots of their tank gun and continuous treskotnja a turret machine gun were added. Then German bullets have begun to patter on the reservation, and she has ceased to discriminate a voice of the commander in ear-phones. But Chumakov has already appeared about it and began to command signs. In the slot it was visible, as our tanks, spinning, press ditches of the opponent. marusja for the first time has seen running figures of Hitlerites in grey-green service jackets. At this time bullets have begun to knock about the reservation especially often and sonorously, and the lieutenant has slapped it on the right shoulder. It has sharply developed the tank to the right and has absolutely close seen a blindage from which in an emphasis knaped a machine gun. The push in a back has immediately followed, and it has pushed an accelerator. Blindage logs have cracked under crawler bands - she did not hear, and has as though felt it. - On the first time it was well gained. The good fellow, Lagunova! She has looked round. The dust and the smoke which has clouded all around, gradually settled. Everywhere the corpses of the Hitlerites who have been stained with blood, crushed, in the most arabesque poses were fulled. The reverse guns, vehicles, horses with the unstitched bellies... marusja did not feel fear during the battle, absorbed by the work, but now, at the sight of this terrible picture of war, to it it became terrible, she has felt, as to a throat the nausea rises, and has hasty got into the tank that nobody has noticed its weaknesses. And after that there were many other battles, both heavy and easy. It confidently conducted the tank, pressed Hitlerite entrenchments, trod out machine guns, guns of the enemy, saw, how cars of companions burn, cried over tombs of battle friends. The team went all further on the West, through Sumy, Chernigov and, at last, the Kiev area. And anybody did not doubt any more the girl-tankman: marusja has proved to be the skilled and courageous motor-man. "... I asked the commander of a batallion as behaves in battle of Lagunova, - remembers were kombrig T.F.Malik. - On me reported: "Lagunova is at war well. Courageous, it is skilfully applied to locality". We have attained the river Dnepr in the disctrict of the city of Perejaslav-Hmelnitskogr. Maria Lagunova accumulated battle experience more and more. In a team about it already spoke: "It is our tank expert". It had the present battle authority with tankmen. On its account there were many weapon emplacements crushed by crawler bands, guns and fascists. Soon the team has obtained the order to occupy Darnitsu, a disctrict of the city of Kiev on the left I protect Dnepr. Executing the order, the team has fastened a difficult fight at settlement Brovary ". At this time behind shoulders of Marusi Lagunovoj was twelve attacks. Battle for Brovary became the thirteenth. - Look! Thirteen - number unhappy. Lagunova, we will go together to this attack. - Marusja, we should be first! Give forward! At first all went well. Captain Mitjajkin commanded the tank, and lieutenant Chumakov has risen to a machine gun. They first have rushed on a position of fascists, and Marusja saw, how run up and Hitlerites drop under machine-gun fire. - Give hardly is more right, - Mitjajkin has ordered. - There German pushechka to ours prevents, we will slam it. It has developed the car and has rushed forward. German gunners have rushed in all directions, and the tank, the case having cast away the instrument, has flown through an ammunition entrenchment. But, probably, somewhere the second gun nearby has hidden. The tank has suddenly yanked, the motor has choked, and in a nose the caustic ashes have struck. More than anything Marusja did not remember. She has regained consciousness in a field hospital. At it both feet have been amputated, the clavicle and the left arm is broken in seemed become lifeless. All inside as if has been constricted in vice, and the head broke up into units. The pain took away all forces of soul and a body, and she could not think of that at all that to it has occurred. On the airplane it have forwarded to Sumy, therefrom to Ulyanovsk, and then to Omsk. Here Valentine Borisova's young courageous surgeon did to it one operation for another, being aimed to rescue her feet how much it was possible that then it could go on artificial limbs. Boldness and persistence Borisovoj going sometimes on risk contrary to councils of senior and more careful surgeons, Lagunova it is obliged by that there has stepped day when it has gone by the ground without crutches. But till this day still it was necessary to live, having passed through assemblage of physical tortures, in never-ending months of moral sufferings. The consciousness of hopelessness and a future hopelessness even more often and more strongly embraced the girl. She cried, grew dark, and no consolations of doctors helped. And suddenly again good, sympathetic people, its old friends, have come to the rescue to it during the heaviest moment of her life. From a tank regiment where it has gained a trade of the mechanic-driver, to Omsk there has arrived the whole delegation - to visit the heroine. Tankmen have brought Marias 60 letters. It was written by old friends, unfamiliar cadets from new replenishment wrote. Have sent letters full hot participation the brigade commander colonel Maxim Skuba and its former battalion commander major Honin. She has learnt that in a room of glory of a regiment its portrait hangs that its military biography is known to all cadets and helps commanders to educate for front of new resistant fighters. 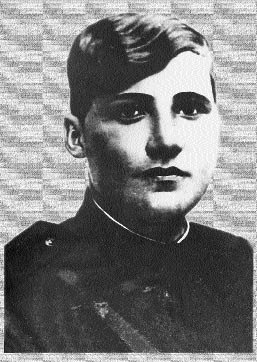 To it wrote that it has no right to despond that for it wait in a native unit that tankmen of new exhaustions, going to the front, swear to take vengeance on enemies for Maria Lagunovoj's wounds. And it has cheered up from these letters and from stories of the arrived companions. She felt not only necessary to people, but also as though being still in battle I build. In the spring of 1944 it have brought to Moscow, in prosthetics Institute. Here again friends from a unit visited her, sent it letters. It has met here Zinoj Tusnolobovoj-Marchenko who has lost in battle and feet and the arm, and soon to both heroines have handed over awards of the Red Spider. - When I have for the first time put on artificial limbs and was drew by strops, - Maria Ivanovna Lagunova remembers, - I have suddenly fathomed that this heavy misfortune will be on all life, to the death. And I have thought: whether I can to stand it? The first trying to go it has appeared unsuccessful - I have implanted to myself of bruises and cores. But professor Chaklin, whom so a lot of work has enclosed to put me on artificial limbs, has strictly forbidden to the personnel to give me a stick. Daily trainings have begun, and in some days I gradually began to travel. She learnt to go with the same persistence with what once learnt to drive the tank. To day of an exit from hospital for Maria Lagunovoj there has arrived the courier from a regiment with an order to be to it in a unit for the further service. Command has enlisted it, as regular, on a post of the telegraph operator. Once, having come to this regiment, Marusja Lagunova has flatly refused any indulgences which wanted to make to it, as to the unique girl from among cadets. Now it as refused flatly any preferences to herself as to the invalid. Companions, were knocked its determination. The former brother-soldier Lagunovoj uralets Alexander Chervov has well written to me about it in the letter: "In all its iron character, persistence, persistence was visible. She often refused offers to bring up it by the car, tried to go more on foot on artificial limbs. It is easy to present, what tortures this walking cost to it. But she, as well as its colleague on fate Alexey Maresev, persistently trained herself in walking for she knew that its life long and to go to it on our free land it is necessary much". But all this time Maria Lagunova invisibly leant against the big encouragement of the companions-brother-soldiers, encircled its warm care, warm human attention. "I will be grateful all life to command of a team and a regiment for care and caress, for determination to return me life", - Maria Ivanovna Lagunova writes. It has served in a native unit almost four years. And when in 1948 Maria Lagunova, having got demobilise, has arrived to Sverdlovsk, there were other same sympathetic people, too the old companions who have taken care of it. It was plant "Уралобувь" collective led by director S. T.Kotovsh. It have arranged to work as the controller of Quality Department, have given it a room. Work was not heavy, but, held down by artificial limbs, it for eight hours reached exhaustion. Once, late coming back home after the second change, it has fallen - the artificial limb has turned up. Too exhausted, it could not rise itself in any way. Companions on plant have left forward, the street was deserted. The company of casual passers-by then has in the distance seemed. Lagunova only has collected to call to them as one has derisively told: "Well and nalizalas!" - and all have laughed. It as if have lashed on cheeks, and it has burst into tears, and has then decided that begins to ask nobody about the help. It is literally on centimetres, leaning against one arm, it has crawled to standing ahead of a column and after long force has risen from land and has reached home. - You know, Maria, give we will get married. It will be together easier to bunk. - After all we two invalids, - she has objected. - nurses are necessary to both of us. - From two invalids one high-grade person will be gained, - Kuzma has laughed in the answer. They have got married. 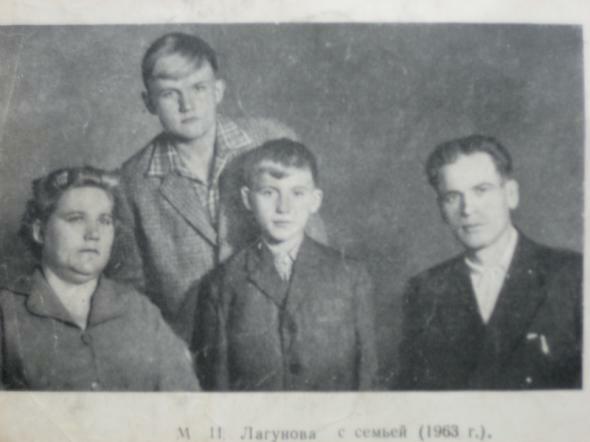 In 1949 the son whom named Nikolay in honour of Maria's perished brother was born. Four years the second son, Vasily later was born, - so called brother Kuzma Firsova killed in the war. Children, house efforts have forced M.I.Lagunovu to give up work at plant. But collective of workers, zavkom and Communist Party committee still remained chiefs of the heroine of war. To a family have given two-room apartment, at times rendered the necessary help. And in 1955 it was necessary to leave native Ural Mountains: M.I.Lagunova was ill, and doctors have ordered it climate change. They have moved to Ukraine, to a city Khmelnitskiy. The former mechanic-driver "tridtsatchetverki", the battle tankman who has passed with battles a way from the Kursk arch to Dnepr, M.I.Lagunova now simplis housewife. Her husband K. M.Firsov - the master of a factory of transformer substantions. Elder son Nikolay - the student of Kamenets-Podolsk industrial technical school, younger, Vasily, - the third-grader. Life of the nice heroine of the Great Patriotic War has entered in strong, though also a hard track as thanks to persistence, persistence, backbone of this remarkable woman - the present person of our heroic epoch, and thanks to friendly aid and a support of tens good, sympathetic Soviet people. "Here so we also live, - completes one of the letters to me M.I.Lagunova. - moreover someone envies us, though it and is silly, but the fact remains". There is no, perhaps, it not so silly, here Maria Ivanovna is mistaken. As it is possible not to envy the person who with such dazzling advantage has taken place such tragical and nice way! It the heroine of war, the heroic fighter in post-war life, this modest and proud woman from working Ural Mountains. Its character and will were strong, as the Ural steel, its fate is bright and extraordinary, as the Ural semi-precious stones, and all its biography - a feat. To such people it is good, humanly envy, them admire, on their instances learn and educate youth. Here again has no value that fact that on a breast at M.I.Lagunovoj only one award of the Red Spider. War has left to us many unknown heroes, whose awards - I am assured of it is still ahead. And not in awards business. For the hero memory of the people, love and respect of people becomes the best award. On the eve of the International women's day on March, 8th, 1964 I have in detail told in one of broadcastings by television about Maria Ivanovne Lagunovoj. In the end of transfer I have informed televiewers the present address of the heroine: a city Khmelnitskiy, street Frunze, the dwelling 58, apartment 4. I how necessary expect, reaction was instant. For any 10-15 days to this address has come more than 6 thousand letters from different corners of the country, from the most various people. It was the stream of feelings, deeply warm, hot, full admiration and pride of a vital feat of the woman. And though Maria Ivanovna Lagunova on the modesty inherent in true heroes, persistently protests against it considered as the heroine, I am assured that people writing to it have forced it again and in a new fashion to look back for the years left behind, and to feel that its biography has ceased to be its personal property and has become the phenomenon general, embodying for million our citizens a fine, pure and high image of the Soviet woman of memorable years of the Great Patriotic War.